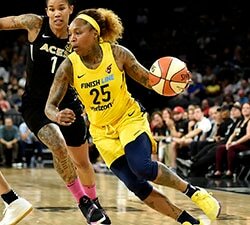 NEW YORK — The third-seeded Indiana Fever had few believers entering the postseason. That fact, however, had less to do with any shortcomings they may have and more to do with the higher seeded teams in the East receiving the lion’s share of attention instead. 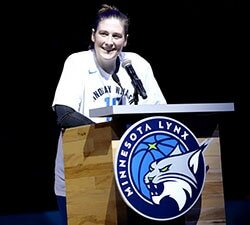 First there was the reigning Eastern Conference Champion Chicago Sky. With newly minted MVP Elena Delle Donne leading the way, the Sky seemed poised to make another deep run. Then there was the Liberty, the big-city team that owned the league’s best defense and best record to boot. Both teams garnered more attention. Both had their seasons ended by the Fever. 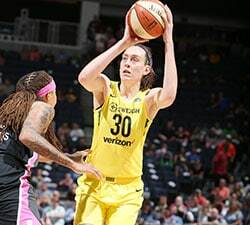 So, with an improbable trip to the Finals booked – the Fever defeated the Liberty in Game 3 of the Eastern Conference Finals on Tuesday night– it’s finally time for this team of overachievers to tell us why we should have been believers in them all along. Briann January: The character, the heart, the toughness that everybody on this team has is unbelievable. We were counted out from the jump. We were the underdog and we kind of like being the underdog. That’s where we thrive. Shenise Johnson: I wouldn’t rather go to war with any other group than these 11 women right now. I’m happy to just be a part of this team and this organization. We do everything the right way, literally, hard work and toughness. January: If you followed our series, I think you’d see how bad (Catchings) wants it. In that second game against New York, she single handedly willed that game and everyone else jumped on board and rode her wave. Her energy and her passion is contagious. Like she said in the media room, she’s playing for us and we’re playing for each other and that’s huge. 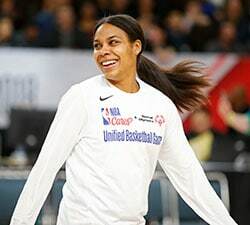 I don’t think you need any added motivation when you’re in the championship, but having her on your team give you all the confidence in the world. Tamika Catchings: We would run through a wall for (coach White). …It’s just when you know somebody’s on your side and somebody cares that much. …We all believe in her, we do. Johnson: The thing about it is, with the players that we had, people didn’t know how it would work out. …She did a great job of bringing us together. She kind of understands us, she knows how to get us going, but at the same time she knows how to keep us poised and that’s special for a first year coach. It’s kind of scary to think how she’s going to be in about five years. Layshia Clarendon: If you look down our bench, I think four of our five that are in at the end of the game — Zellous, [Briann January], [Erlana Larkins],and Catchings — have won, so I think that they have that ‘been there, done that.’ Their poise, they take us on runs. They know that when [the Liberty] started coming back that we just had to hit shots. January: With our veteran-led team we have a nice solid core that’s been there, done that, and was on that 2012 team. They know what it takes to win in this type of situation and I think that showed.